If you have sailed a J/70 and have not run into (figuratively, not literally) Jenn and Ray Wulff then you need to get out to more regattas! This Annapolis based couple runs the fun, “family-centric”, goal-oriented program that is “Joint Custody”. Their Corinthian program has earned them a place on everyone’s “who are the boats to beat” list at every major event. Coming off their win as the Top Corinthian team at the 2018 Midwinters, Ray and Jenn share their thoughts on the importance of practice, the goal of developing a team and having a “deep bench” along with their 3 top tips for the approaching summer season. What was it that first attracted you to the J/70 class? 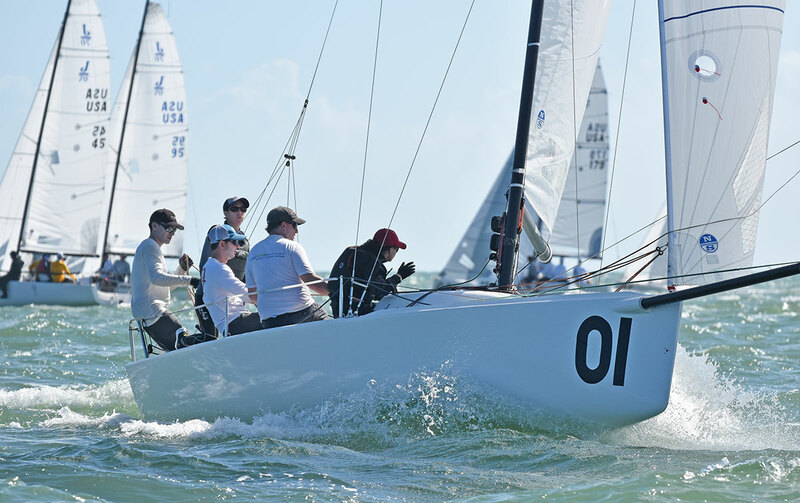 Ray: Jenn was racing in Key West on a big boat and saw the J/70s planing around the race course. Within a day of returning to Annapolis, Jenn let me know that we were going to sell our current boat, we were buying a boat, and she asked my help in her getting back into driving as the J/70 seemed like a boat where anyone could drive or crew, regardless of physical size or age (Jenn is 5’2”. She had been crewing for me & sailing with other teams for years in J/22s, Mumm 30s, Farr 40s and other boats. She hadn’t driven since junior sailing and wanted to get back on the tiller). Additionally, we were looking for a one-design sport boat where we didn’t need a crane or a gin pole to go sailing and that had a good group of people. The J/70 seemed like a strong fit. What is it that you enjoy most about racing in this class? Ray: Definitely, the people! It is an awesome fleet with every level from rank beginner to World champion and everyone in between. The boat is super accessible in that anyone can drive & crew – no matter size or age. There’s also a lot of camaraderie in the class. Everyone shares with each other what they are working on getting sorted which is great. Jenn: We are ALWAYS learning!! It is very easy to sail the 70 well. There is enough information provided by sailmakers, experts, and videos to get you up to speed. That being said, to sail the boat at a very high level, you always have to be learning. The evolution of the class, how to sail the boat, and sail design is constantly evolving for the better. It’s fun to always be learning & having the opportunity to train with others & develop together. 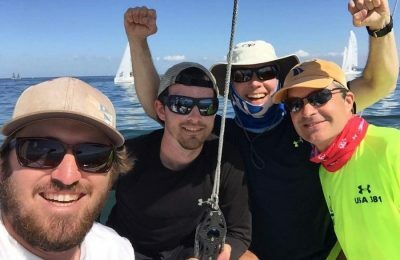 You’ve spent a lot of time sailing Corinthian against all the top teams in the World, what is your mindset going into a regatta where all the “top dogs” are there? Ray: I think we try to focus on our process and adjust as we see the top teams improving theirs. Jenn has drilled this into our brains, “Trust the process.” What I mean by that is to have a plan for the season, regatta, day, and race. Having this mindset lets you focus on YOUR race, and not get to distracted by the players in the fleet. We also seek to learn from the pros and top teams. We view it as them raising the bar makes us all better. How do you prioritize your time preparing for events? Do you practice? Do you do local events? Do you select a certain number of “priority events” at the beginning of a year? Jenn: Good question. The biggest adjustment is planning our schedule long in advance for the regattas that require days off. With everyone working, having that schedule out early lets people plan their schedules, see what they can commit to, and plan logistics. Ray: When the class schedule comes out, we try to scope four major events a year and see how we can have the same crew for those. Interspersed are local events and possible practice regattas which can benefit the majors. We also try to build a deep bench of crew knowing that everyone has jobs with limited time off, it’s important to be able to have consistent crew across a variety of events. You have sailed with a number of different crew over the last few years, but the two of you are the staple on “Joint Custody.” How do you delegate the roles and divvy up jobs when adding new crew? Jenn: I think it depends on the regatta. If we have our regular main trimmer on board, we try to fit new crew into other roles. If our regular main trimmer isn’t there, I slide back to that role and work with the team we have. We try to keep people as consistent as possible and focus on our consistent process, but also recognize that everyone have jobs and can’t be available for every event. We line up crew well in advance and try to have a few core folks for each position. Ray provides great consistency as he’s the tactician and can also be a main or jib trimmer when needed. What are 3 tips you would give to any J/70 team when approaching a season? Have a large bench and always grow it. Everyone has busy lives so there is no way you will have the same crew every regatta so make sure you have a large bench to choose from. Schedule out the season early and reach out to your “A-Team” to see their availability. (Can I emphasize early!). From there you can see what holes you may need to fill. Value your crew’s time. They are taking time away from their families, jobs, other hobbies. Have the boat, sails, equipment ready to go. Make sure housing, travel, and logistics are sorted out. Respecting the crew’s time is paramount in building a strong Corinthian team. And remember to have fun! Develop your goals for the season & for each regatta. Have a plan & stick to it & always reach out to the top teams and pros/sailmakers to ask questions & for help. We’ve progressed a lot by asking others for tips & having a tuning partner at each regatta. A huge thank you to Jenn and Ray! 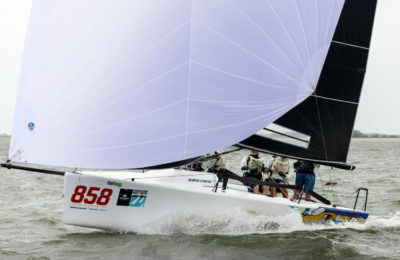 Learn more about the North Sails J/70 sails.